Thrive hosts events that empower and unite young women with disabilities around the world. Below you will find links to our current and past Twitter chats, book club events, hashtag campaigns, and more. Disability in Film live chat: On May 16th at 6:30pm EST, join the Thrive group for an online meetup to discuss disability representation in movies! We will share the link to join the video chat closer to the event date. Book club topic on Facebook: What method of reading is most accessible to you? What are the pros/cons of audiobooks vs. ebooks vs. paper books? #DontFearDisability: A Twitter chat reflecting on disability in horror fiction. #InclusiveDisability: Diversity is great, but inclusion is better. Find out why in the recap of our latest chat. #DisabledWomenLead: We explored how women with disabilities can take on leadership roles in their lives, including in the work place. Featured guests were Madeline Stuart, Keah Brown, Jen Venegas, and Jessica Jones. #ResolveToRespect: Disability and respect, what does it mean to you? #ThriveBooks: Mishell Baker, author of Borderline, joined us for a fantastic discussion on disability representation in literature, the craft of writing, and getting published. #FearlessPWD: A thoughtful, inspiring chat about how we can work together to understand and conquer our fears. #PWDfashion: Why is it important to talk about disability when it comes to fashion? How can we make clothes, stores, and styles more accessible? Our lively chat tackled all this and more. 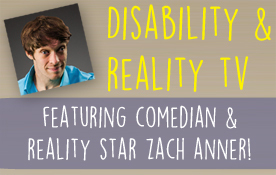 #ThriveTV: Zach Anner, YouTube star and award-winning comedian, joined us for a Twitter chat on disability representation on reality TV. We even gave away copies of his book If At Birth You Don't Succeed! #DisabilityBeauty: Everyone has the ability to be chic! Check out what the Thrive community had to say about body image, beauty, style tips, accessible fashion, and clothing hacks. College and Disability: During our twitter Q&A on disability and academia, our guest panelists offered advice on everything from applying to schools and setting up your support network, to living on campus and making new friends. Food and Disability: How does disability affect your access to food? How can restaurants be more accessible? We answered these questions and more during this fun and informative chat!